It's the weekend so time to get glammed up! Make up has to last the whole night when you're partying so a great foundation is essential. I am yet to find one that stays on the skin as well as oxygenetix. The staying power is incredible! I like to mix mine with the Nars liquid bronzer, another must have, for a glowy finish. Apply with a stiff but blendable brush- Roxie from my range gets it spot on! Who doesn't love a bit of contouring- after all the weekend is when we look out best. The Rodial Contouring Powder is lovely! The tones are quite flat which means you get a more believable contour and it gives definition in the right places. It's so hard getting the tone of a contour powder right but Rodial have mastered it. Lashes set off your eyes, whether they be natural or full on flutter. I'm a big fan of Ardell Demi Wispies and the natural lash style too. Just make sure you trim them to size so they don't pull your eyes down. The shorter ends go on the inside of the eyes and they fan out to the longer ends on the outer corner. Give your lashes a curl first. I have the B. Eyelash curlers which are great! After apply the lashes, then blend into your natural lash with mascara afterwards. I like lip colours that are easy to apply and low maintenance so I was so happy when the Rodial Lip Suede landed on my desk this week. The colour and texture are great, natural yet glam. It's a quick crayon and you're ready! A little insider tip to top off your look is the kryolan makeup fixing mist. Everyone wants a makeup that doesn't budge so this professional product is worth investing in. Spray at a distance over your face and it washes off easily with warm water. Party hard and don't forget to wash it all away before bed time. My new must have is the B. Stubborn Makeup Remover available from Superdrug. It's great because it's gentle and doesn't leave a greasy residue. One wipe and you're fresh as a daisy. I am so excited for this new course! Our bridal and occasional makeup course has been so popular and given so many opportunities for people to start their makeup career, it’s great to see. As you can image though, it’s very difficult to teach people all the skills needed to become a makeup artist in one week. That’s why I have now introduced our Pro Skills Course, as this is a perfect top up to the Bridal and Occasion Makeup. If you feel like you’ve nailed the ‘going out’ looks market and are doing ok with your bridal work but really want to push yourself forward into the fashion industry, then this course is for you! To book your place call Cassie Lomas Makeup Academy on 0161 236 5567 or email us at info@cassielomasmakeupacademy.co.uk. Dark Lips caught everyone's attention this season starting with the 'Hole' created by Val garland. I am a huge fan of Val's, in my eyes the queen of British makeup, so she is always my first go to to see what's hot on the catwalk. My favourite look from Val this show season was of course Gareth Pugh. THE LOOK OF A HOLE. "Tense & Urgent: Francis Bacon's Head VI Painting." Val Garland. Val's look for the Preen show was also a definite standout and it shows that bare makeup does not need to be boring! 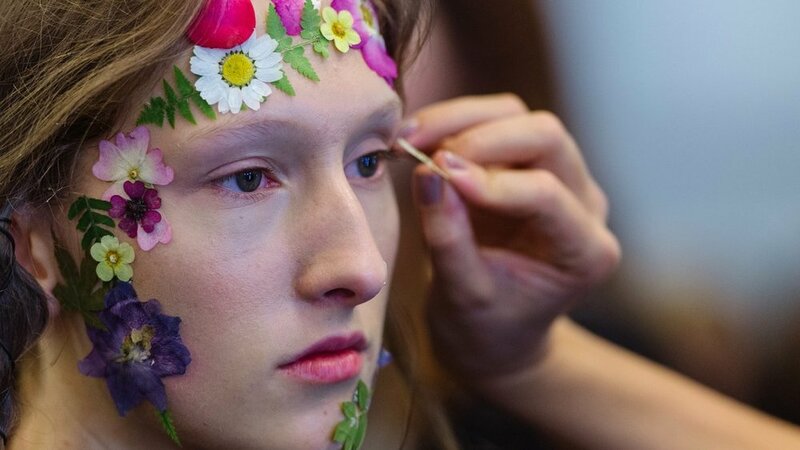 Delicately placing pressed flowers on the the faces and bodies of the models created a look that completely innovated the spring flowers theme in an incredibly dreamy and whimsical way. 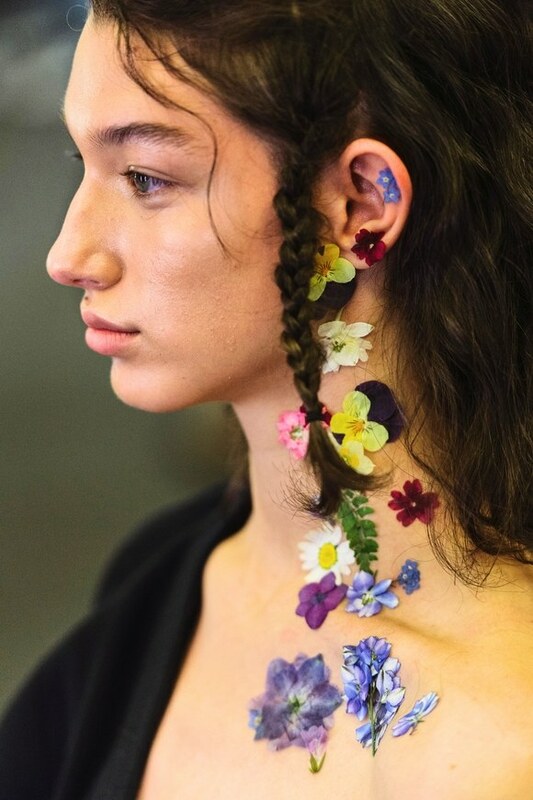 Fresh dewy skin was again the base for this look using the colourful flowers as an embellishment. I am also a massive fan of Andrew Gallimore and you can always rely on him for edgy and eye catching looks that never fail to inspire. 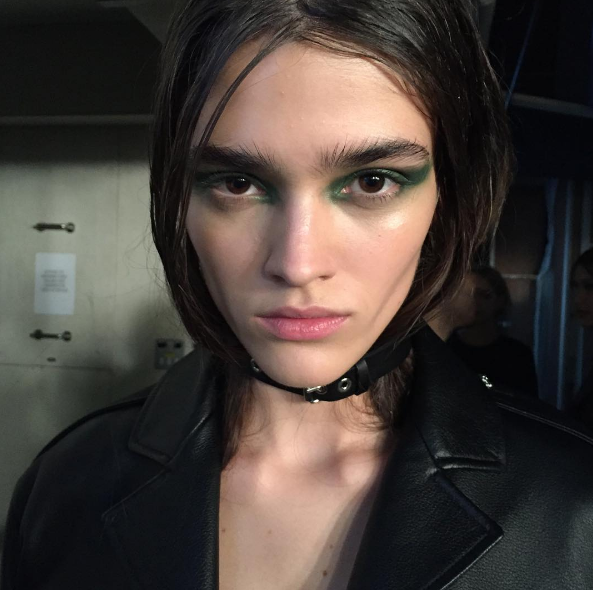 I love the amazing dark lip look he created for Fyodor Golan. The metallic Cupid's bow sets this apart from the norm and shows Why Andrew is a creative genius. So simple yet so effective. A lot of the shows this season focuses on bare skin, sheen and gloss. I've always been a fan of sheen, I just think it lifts everyone's complexion. Make sure you invest in the MAC Prep & Prime+ to ensure you get that dewy fresh finish with a lasting glow. My favourite show for creativity was hands down the Sophia Webster show. Val Garland used graphic black liner to create distinct lines on the eyes in various shapes which ties in with the overall 60s theme of the collection. An integral part of my makeup courses at CLMA is to teach students how to research the history of makeup. This shows how you can take inspiration from decades and really have fun taking it into 2017! 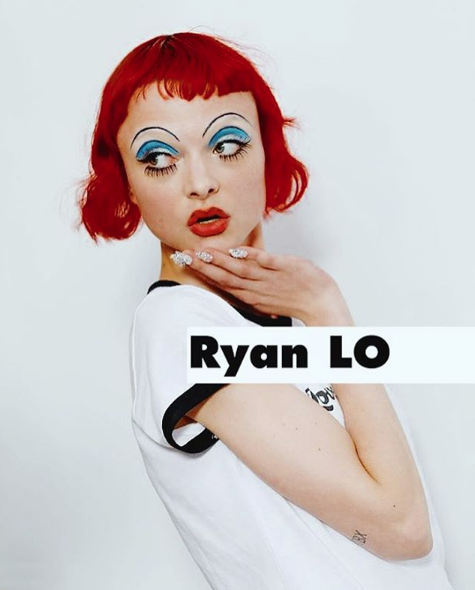 This throwback look for the Ryan Lo show by makeup artist Isamaya Ffrench is a perfect example of bringing era makeup into current fashion trends. She created a seamless merge between a China Doll and the Venetian Circus that brought together the overarching themes drawn from different cultural stylings. Embryolisse- all the models are pulled from pillar to post so need a lot of skin TLC. This moisturiser is the staple prouduct backstage for hydrating and priming without overloading the skin. Your job doesn't stop at makeup- you're expected to help out in every stage so make sure you have your protector hood at the ready because the last thing any designer wants is a foundation stained neck line. A Light coating of mascara is key for fashion week looks so get your fan brushes at the ready and paint away. Spike brush is available at www.cassielomas.com. That's my LFW Wrap Up! Comment with your favourite looks of this season. Celebs are loving the Cassie Lomas Makeup Brushes!! The launch of my brushes has been so exciting! They've so far been written about by Michelle Keegan on her Hello Magazine Blog and The British Beauty Blogger on her hugely successful blog too. I also have a few celebrity fans from Coleen Rooney to Jenny Frost and Cath Tyldesley from Coronation Street as well of course as my little sister Charley Webb from Emmerdale who has a selection of the brushes named after her and my gorgeous nephews Buster and Bowie. Check it out below and be sure to visit my shop!